Rectangular table top in marbles and hard stones. Inspired by Italian models from the XVI-XVII centuries. Rectangular board with a central zone decorated by three outstanding ovals with a band of geometric motifs, and four reserves in the corners with stars; This area completes a series of vegetal elements of clear classicist inspiration. To the outside, a frame with rhombuses in the corners and circular geometric motifs completes the work and highlights the stone of those three ovals. 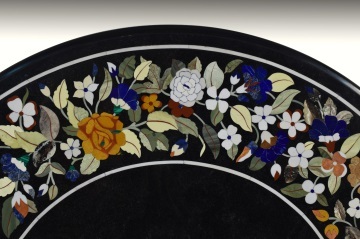 The work of hard stones is a technique similar to marquetry that, instead of wood, uses marbles and stones of a hardness greater than 7 on the scale of Mohs. 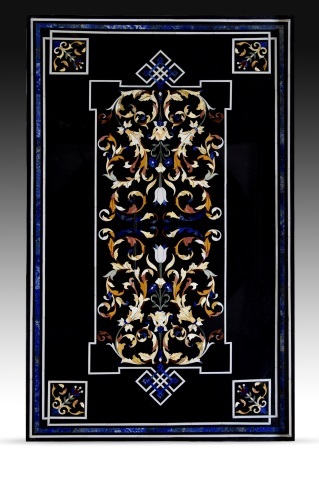 For example, lapis lazuli, jades of different colors, alabaster, paragone, Belgian black marble are common in these works ... Due to the high price of the raw material, which often had to be imported, and together with the fact that it was essential to have a hand of works very specialized, they reached a high price the works realized with this technique, so that the desks, boards, plates and others were destined to the main houses and cuts of the time. The prominence of geometry and highlighting stone areas relates the present example to the beginning of the tradition of hard stone work. Piero de Medici and Lorenzo the Magnificent promoted in Florence the recovery, with thematic and technical changes, the Roman technique of the mosaic "opus sectile". It is in this era where the greatest decorative variety was produced, because, from around 1600, it was the naturalist motifs that ended up prevailing. Over the years, in addition, birds, parrots, laceries, pearls, etc. were added. So much success was the work of hard stones that, since the seventeenth century, were created in Europe a series of workshops that continued with this tradition, among which the Factory of Gobelins in France, the Royal Workshop of Naples and the factory of El Buen Retiro in Madrid. 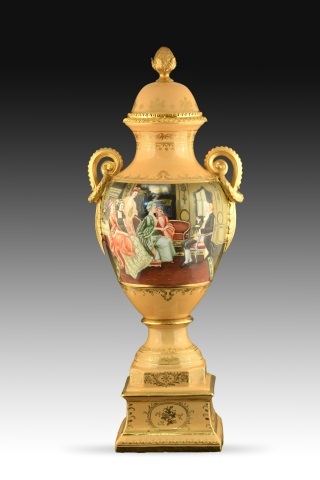 Only important private collections and prominent museums have similar examples in their collections. 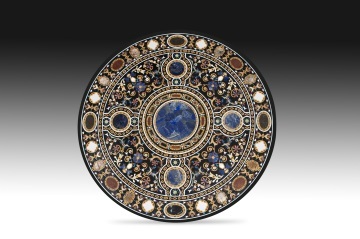 For example, we mention those of the Opificio delle Pietre Dure Museum in Florence, the table top with oval alabaster from the Prado Museum in Madrid (O00134) made towards the end of the 16th century in a Roman workshop, or the roman one from the Metropolitan Museum in New York (inventory 62.259)." 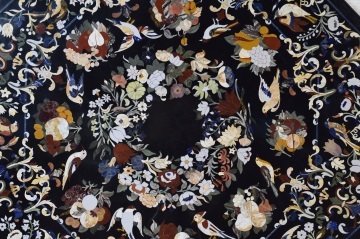 On a black background and, from the inside towards the outside of the board, a wreath of flowers is placed, a band with birds alternating with fruits and an outer zone with vegetal and architectural elements, more flowers and, again, small birds, leaving a thin line in black to rest your eyes. The present example is a clear heir of all this tradition, both technically and stylistically. 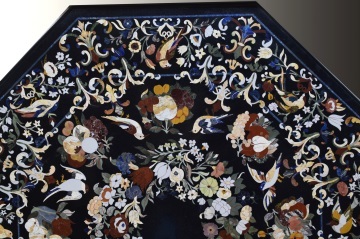 Compare with works conserved in outstanding collections: Museo Opificio delle Pietre Dure in Florence, the table made in the Real Laboratorio delle Pietre Dure in Naples towards the middle of the 18th century (catalog O00466) conserved in the Prado Museum in Madrid, or the panel of the Museum of Decorative Arts in the same city (Inv. CE 27144)." Rectangular table top made of marbles and hard stones. The central motif of the board is a parrot perched on the branch of a fruit tree. It has been highlighted with a polygonal frame decorated with simple geometric elements. Around this one a band has been drawn drawing curves and straight areas to the way of the Renaissance scrolls, and the composition completes a pleiad of bouquets with varied flowers and leaves, interspersed with that band. 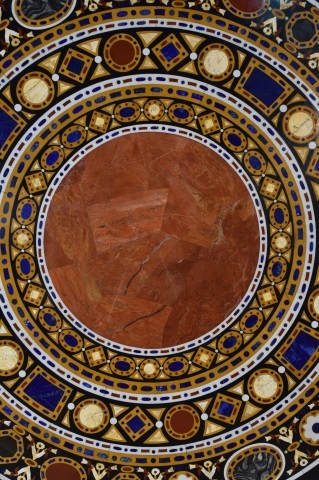 The technique used, called hard stone work, is very similar to marquetry, but it uses colored marbles and stones of a hardness, usually greater than 7 on the Mohs scale. Lapis lazuli, Belgian black marble as a background, jade, azurite, etc. are common in this type of work, and a wide variety of elements such as tables, desks, panels or pedestals were decorated with these plates. Piero de Medici and Lorenzo the Magnificent supported in Florence the recovery, with thematic and technical changes, of the Roman technique of the mosaic "opus sectile". 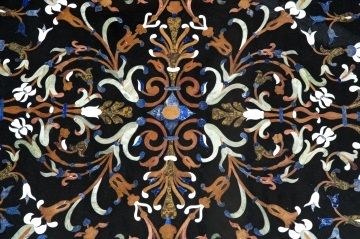 It is in this era where the greatest decorative variety was produced, because, from around 1600, it was the naturalist motifs that ended up prevailing, and it is with this evolution that the present example can be compared. Over the years, in addition, birds, parrots, laceries, pearls, etc. were added. So successful was the work of hard stones that, since the seventeenth century, a series of workshops were created in Europe that continued with this tradition, among which the Gobelins Factory in France, the Royal Workshop of Naples and the El factory stand out. Buen Retiro in Madrid. Only large museums and prominent private collections retain similar examples. 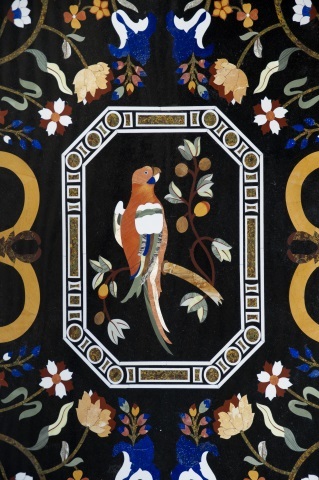 Compare the so-called "Scagiola" of the Victoria & Albert Museum in London (W.6-1933) made in the eighteenth century, those of the Opificio delle Pietre Dure Museum in Florence, or a board with owls and birds in the Villa di Poggio Imperiale from the same city, or one from the Museo del Prado in Madrid by Francesco Ghinghi at the Real Laboratorio Delle Piedre Dure in Naples (catalog number O00511)." Circular tabletop in marbles and hard stones. Inspired by Italian models of the XVI-XVII centuries. In the center of the board, surrounded by a garland of flowers, has been placed a pearl necklace with a bow. Around this element, four vases with birds perched on interspersed branches and, more towards the outside, a band with vegetal scrolls are presented. They frame this area with simplified scrolls and one with others more worked and interspersed with avenerated forms and heraldic shields, and posed birds. 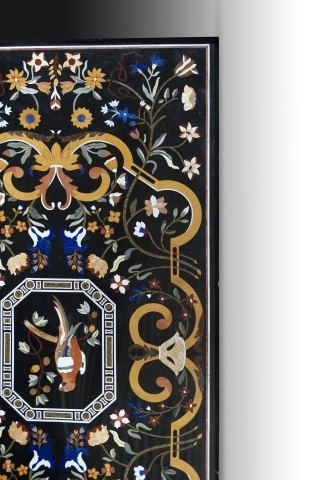 The fleur-de-lis on the edge clearly shows the influence of Gobelino's works on this board. 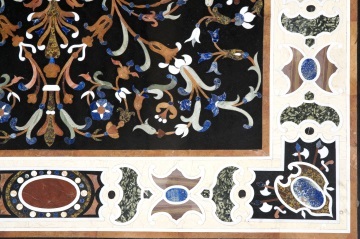 The French workshop was created with the aim of making this type of inlay for the court of this country, and is the heir of the native center of the "hard stone work": the Florence of Piero de Medici and Lorenzo the Magnificent, who wanted to revive a Roman technique called mosaic "opus sectile". It is also necessary to mention the Royal Workshop of Naples and the one created by Carlos III in the Real Sitio of El Buen Retiro in Madrid, which closed at the beginning of the 19th century. 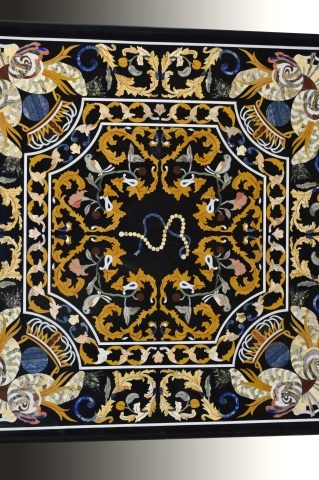 After 1600 the primacy of decoration that appeared in the fifteenth century is clear, and elements such as birds, butterflies and pearl necklaces were added over time. The present example inherits all this tradition: compare with the table realized by Francesco Ghinghi in the Real Laboratory Delle Piedre Dure of Naples (number of catalog O00511) and the board (O00466) of towards half-full of century XVIII, both in the Museum of the Prado from Madrid, those preserved in the Museo Opificio delle Pietre Dure in Florence (especially works such as the panel made as a model for a table by Jacopo LIgozzi around 1610). 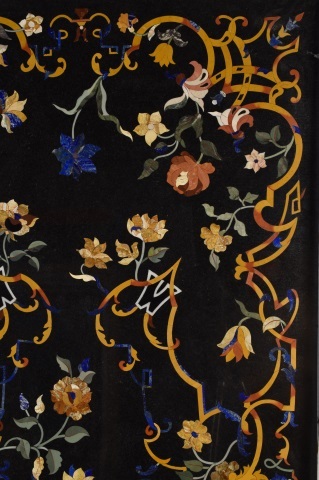 Traditionally, a technique very similar to the inlay was used, but using, instead of wood, marbles of different colors and streaks and hard stones (greater than 6 in the Mohs scale) such as lapis lazuli, agates ... In the present example They have included many of those employed in the works of the sixteenth and eighteenth centuries, which makes it an outstanding work." · Size: Diam. 150 cms. Rectangular table top with marbles and hard stones. Inspired by Italian models of the XVI-XVII centuries. The vein of a particular stone has been highlighted by placing it in the center and surrounded by a necklace with round and rhomboidal beads. Around him, it emphasizes a decoration based on vegetal scrolls with flowers, of marked classicist inspiration. To complete the composition, without removing the protagonism of the central area, the outer band shows a series of empty mirrors inside the posters that remind those employed in the Renaissance. 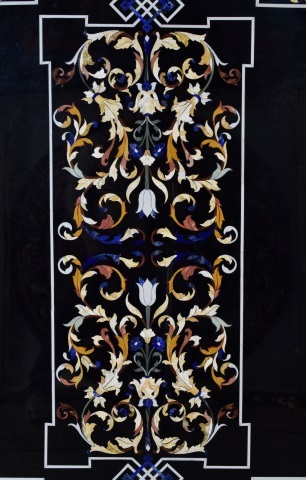 The technique is very similar to inlay, but it uses marbles and hard stones (more than 7 on the Mohs scale) to make those designs. They were made with "hard stone work" desks, boards and other objects. Usually, lapis lazuli was used together with Belgian marble in the background, accompanied by jades, chalcedony, etc. The price of the material and that of the specialized labor raised so much the cost of this type of works of art that its recipients were only the main houses and courts of the time, for what today they only conserve in outstanding private collections and in important museums. Piero de Medici and Lorenzo the Magnificent who began to support in Florence a series of works to recover, with thematic and technical changes, the Roman mosaic technique called "opus sectile". 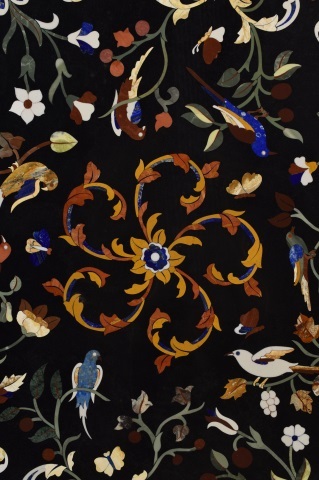 It is in this era where the greatest decorative variety was produced, because, from around 1600, it was the naturalist motifs that ended up prevailing. Over the years, in addition, birds, parrots, laceries, pearls, etc. were added. 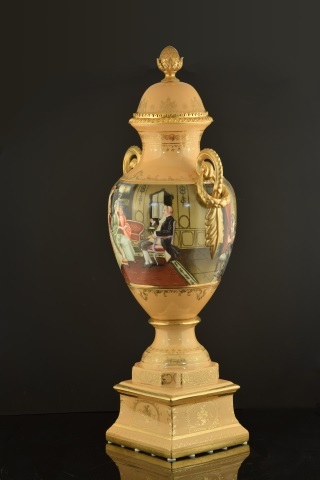 So successful was the work of hard stones that, since the seventeenth century, a series of workshops were created in Europe that continued with this tradition, among which the Gobelins Factory in France, the Royal Workshop of Naples and the El factory stand out. Buen Retiro in Madrid. Compare the present panel with other masterpieces: the "Board of the Duke of Osuna" (O00501) made in 1614 and conserved in the Prado Museum of Madrid has a band to the exterior that remembers it; also highlights the vein of the stone in its central area the "Mesa Farnesio" of the Metropolitan Museum of New York (58.57 ad); and some preserved in the Museum Opificio delle Pietre Dure in Florence." Rectangular table top in marbles and hard stones. Inspired by Italian models of the XVI-XVII centuries. A bird perched on a branch with fruits has been placed in the center, with two fruit bowls towards the smaller sides. 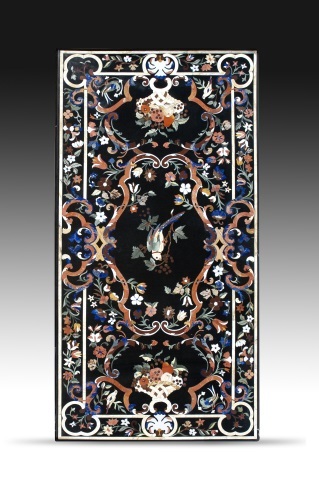 These three elements have been surrounded with bands forming volutes and curves reminiscent of Rococo works, and the decoration is completed with stems with flowers and leaves, which invade the outer frame of the board, without the white band that forms trilobal reserves in the corners look too interrupted by them. For the realization of these boards were used semiprecious stones, very often imported, and a hardness greater than 7 on the scale of Mohs usually, in addition to marbles. 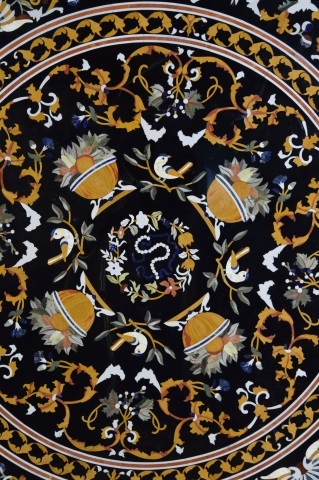 They were inserted on another stone with a technique similar to that of marquetry, called "work of hard stones", and with the resulting plates were decorated a variety of objects, whose recipients were the main houses and courts of the time by the high price of these elements. It was Piero de Medici and Lorenzo the Magnificent who began to support in Florence the recovery, with thematic and technical changes, of the Roman mosaic known as "opus sectile". 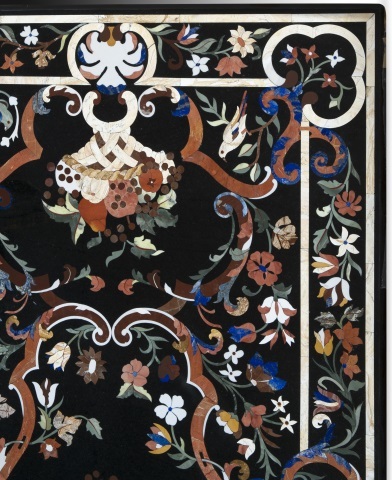 It is in this era where the greatest decorative variety was produced, because, since around 1600, it was the naturalist motifs that ended up prevailing. Over the years, in addition, birds, parrots, laceries, pearls, etc. were added. So much success was the work of hard stones that, from the seventeenth century, were created in Europe a series of workshops that continued with this tradition, among which stood out the Factory of Gobelins in France, the Royal Workshop of Naples and the factory of The Good Retirement in Madrid. Compare other masterpieces such as the panel between 1749 and 1763 of the Museo del Prado (O00467) made in the Royal Laboratory of the Pietre Dure in Naples, those preserved in the Museum Opificio delle Pietre Dure in Florence or a panel in the villa of Poggio Imperiale from the same city, for example." Rectangular table top. Marbles and hard stones. Inspired by Italian models of the XVI-XVII centuries. 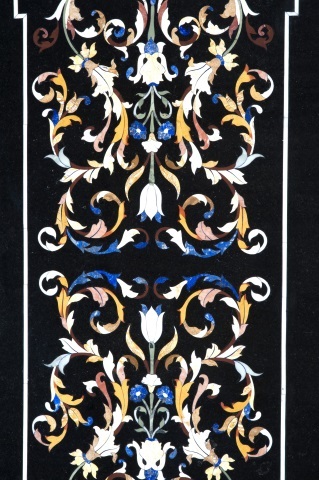 A thin band in a yellowish tone combined with reds and blue areas has been arranged all over the board, rising to the center, which draws geometric shapes and transforms, in some areas, into vegetal scrolls. The composition is completed by a series of flowers that tend to be directed towards the central area. The present example is the inheritor of this tradition, although details such as that game with the band that are not found in old works such as those of the Opificio delle Pietre Dure in Florence, examples of the Prado Museum in Madrid or those of the Metropolitan have been added. Museum of New York." Square table top. Marbles and hard stones. Inspired by Italian models from the 16th-17th centuries. A frame of simple geometric elements and white oval shields accompanied by architectural details highlights, thanks to their light tones, the decorative motif of the center. This one, placed on a dark background, is formed by vegetal scrolls and flowers organized by lines towards the interior, camouflaged thanks to these stems, so that, in spite of the decorative abundance, it emphasizes the flower of four petals of the center. 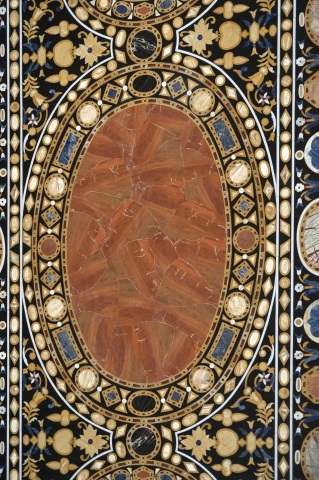 The "work of hard stones" used in this table is very similar to the marquetry, but uses marbles and stones of a hardness greater than 6 in the scale of Mohs. 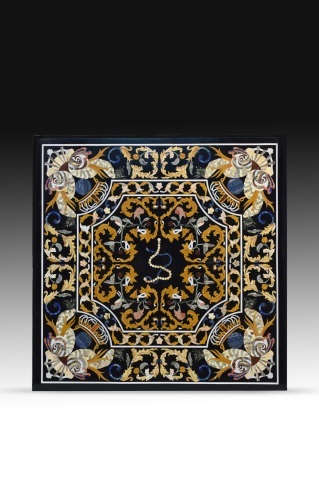 The idea arose in Florence, when trying to revitalize a type of mosaic that used in the ancient Rome called "opus sectile" in time of the Medici. Other European workshops, such as the Gobelins Factory in France, the Royal Workshop in Naples and the one established by Carlos III at the Royal Site of El Buen Retiro in Madrid, Which closed at the beginning of the 19th century. The present example is heir to this tradition. And you can also see stylistic influences. 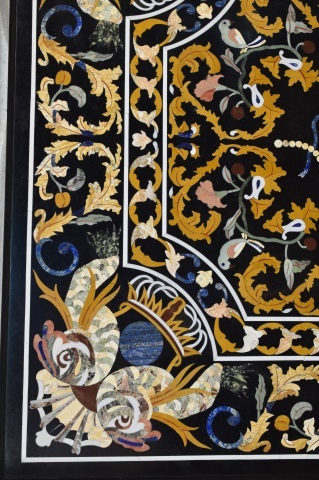 Although at the beginning there was a great variety of decorative elements in these stone inlays, from 1600 the naturalistic motives gained, which were gaining in variety with the time to include butterflies, birds, fruits ... 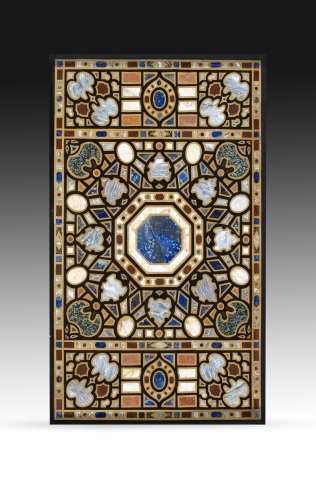 Compare the present example with the conserved ones in The Opificio delle Pietre Dure of Florence, with the Roman chessboard between 1565 and 1590 of the National Museum of Decorative Arts of Madrid (inventory CE 27144) or the Roman anonymous board before 1636 (O00470) of the Museo del Prado." Round tabletop in marbles and hard stones. "Pompanos and grapes". Inspired by Italian models of the XVI-XVII centuries. 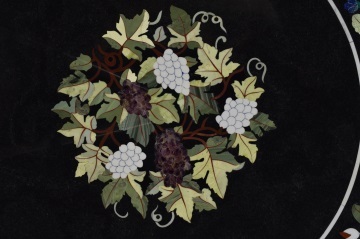 Circular tabletop with a pattern of grape leaves and black and white grapes in the center on a black background. An outer band, marked with two white lines, highlights this element and shows a variegated composition with varied flowers and stems with leaves. 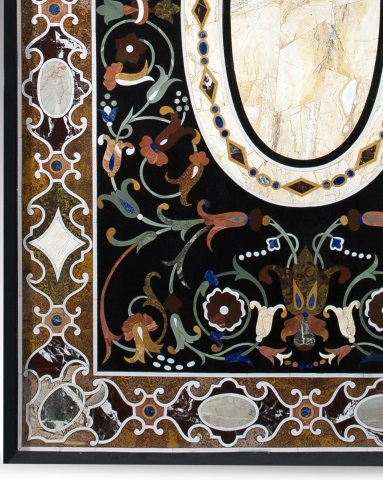 This form of inlay, called "hard stone work", uses marbles of different colors and streaks and stones with a hardness on the scale of Mohs greater than 6. 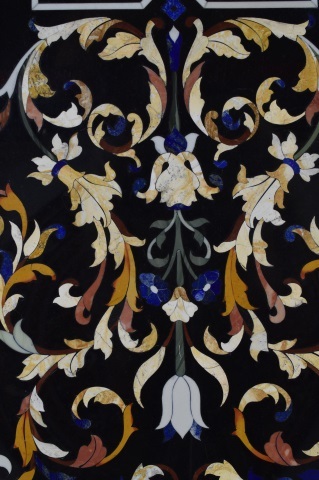 The lapis lazuli and black Belgian marble for the backgrounds were used very often and , as it used to happen with these materials, it was necessary to import them, hence the high price that these works acquired. 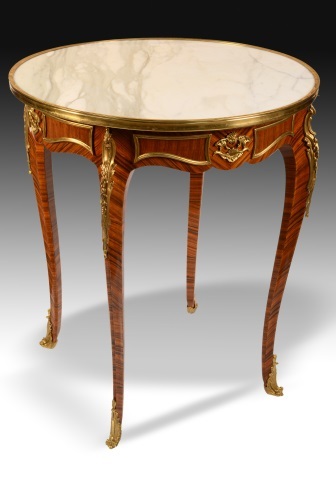 Desks, furniture, vases, plates ... were made for the high aristocracy and the courts in different European workshops. 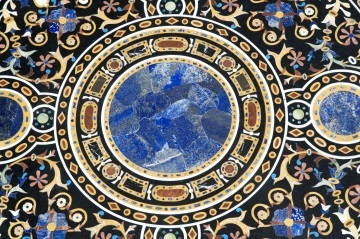 The technique was born in Florence, thanks to the interest on the part of Piero de Medici and Lorenzo the Magnificent to revitalize a technique of the Roman mosaic (opus sectile). From 1600, naturalistic motifs were preferred over the rest of the subjects and other production centers of great importance were established: in France, the Gobelin Factory; the Royal Workshop of Naples took over from the Florentine when the Medici disappeared; in Spain, Carlos III established another one in the Real Sitio de El Buen Retiro, which disappeared at the beginning of the 19th century. The present example is inspired by this tradition. 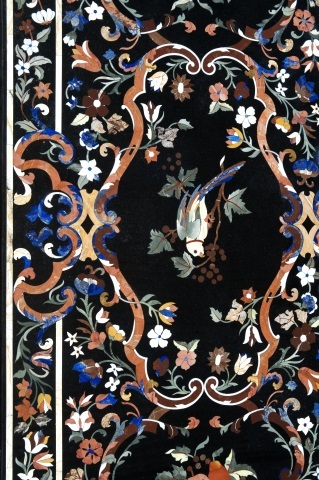 Compare works preserved in important collections: those preserved in the Museo Opificio delle Pietre Dure in Florence, the table in the Museo del Prado in Madrid by Francesco Ghinghi in the Real Laboratorio Delle Piedre Dure in Naples (catalog number O00511), or the panel "Parrot perched in a pear tree" created in the workshops of the Grand Duke of Tuscany in Florence and kept in the Moscow Kremlin Museum (Russia)." · Size: Diam. 120 cms. Circular table top made of marbles and hard stones. Inspired by Italian models of the XVI-XVII centuries. 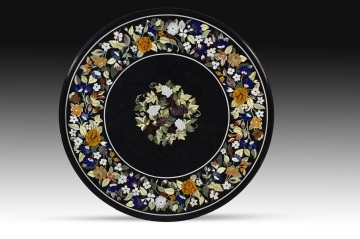 The central circle has been highlighted by concentric bands of different widths decorated with ovals, diamonds and rectangles, some framed, to which are added little flowers and very simplified plant elements on the outside. The black background is barely visible, and, despite the great abundance of elements, the central red stone is the star of the composition. 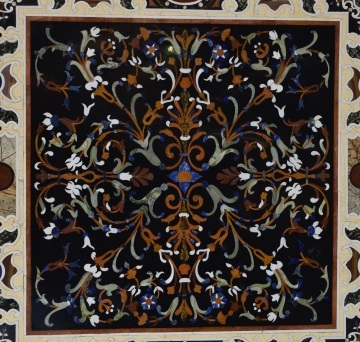 The beginning of this technique, known as "hard stone work" was produced in Florence, thanks to the support of Piero de Medici and Lorenzo the Magnificent to revitalize the technique of the Roman mosaic (opus sectile) made with colored stones, applying the relevant variations of subject and technique. From the seventeenth century, in addition to a change of theme with the primacy of the decoration of naturalistic motifs over the rest, other workshops arose in Europe: the Royal Workshop of Naples takes over from the vanished Florentine, the Factory of Gobelins in France and the one established by Carlos III in the Real Palacio del Buen Retiro of Madrid. With the passage of time, the reasons used in these works would change slightly, adding details such as birds or pearl necklaces. With this technique were made desks, tabletops, panels and plates, vases, etc., and the recipients were the court and the high aristocracy due to the high price they acquired. 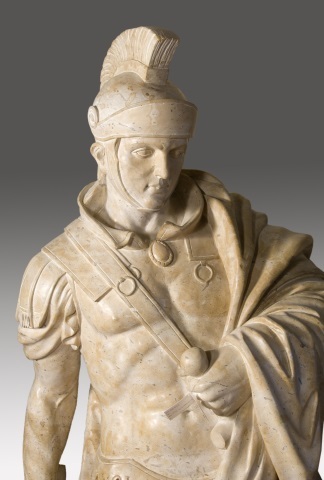 The materials used were, always, marbles of different colors and stones of a hardness in the scale of Mohs greater than 6, which were, often, imported. The present example is inspired by this tradition. Compare, for example, with the Italian panel (O00134) of the late 16th century at the Museo del Prado in Madrid, the table of the Loggetta del Tempo at the Villa di Poggio Imperiale in Florence, that of the Villa del Príncipe in Genoa, the preserved in the Opificio delle Pietre Dure Museum in Florence, or the "Mesa Farnesio" (58.57 ad) from around 1565-1573 held in Italy and kept at the Metropolitan Museum in New York." Circular board with an outer strip decorated with ovals, circles and polygons alternated with plant elements, and a central area with a circular motif flanked on four sides by tondos, the five highlighted by simple figures inserted into other thin bands. The background of this central area is completed with plant elements of classicist inspiration. 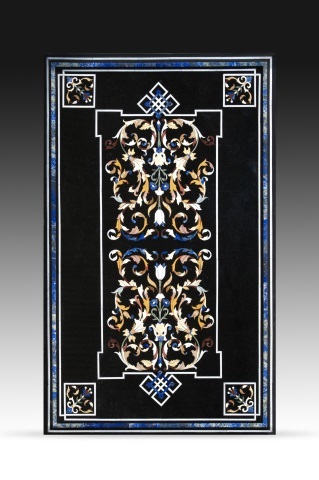 It has been done with a technique similar to inlay that uses marbles and hard stones (more than 7 on the Mohs scale) to make those designs. Clearly highlights the lapis lazuli, but it was also very common to use in these examples azurite, chalcedony, jasper, etc., often highlighted on black Belgian marble. The prominence of geometry relates the present to the beginning of the European tradition of the works of this material. It was Piero de Medici and Lorenzo the Magnificent who began to support in Florence a series of works to recover, with thematic and technical changes, the Roman technique of the mosaic "opus sectile". 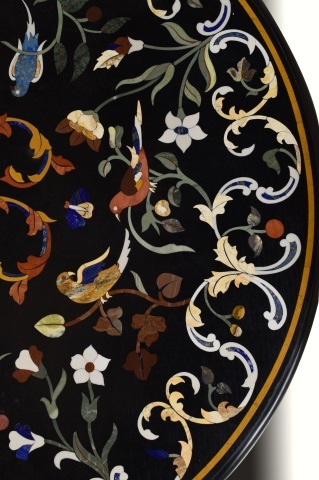 It is in this era where the greatest decorative variety of these boards, desks, plates was produced ..., because, from around 1600, it was the naturalist motifs that ended up prevailing. Over the years, in addition, birds, parrots, laceries, pearls, etc. were added. 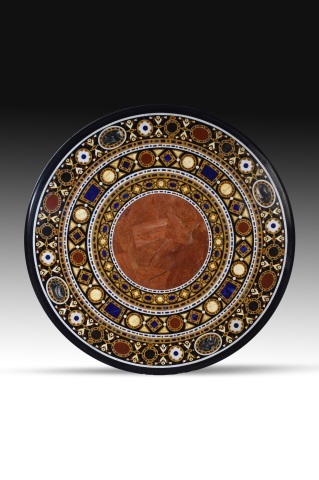 So successful was the work of hard stones that, since the seventeenth century, a series of workshops were created in Europe that continued with this tradition, among which the Gobelins Factory in France, the Royal Workshop of Naples and the El factory stand out. Buen Retiro in Madrid. Compare this work with masterpieces such as those preserved in the Museo Opificio delle Pietre Dure in Florence, or the "Tablero de Felipe II" made in a Roman workshop before 1587 and preserved in the Museo del Prado in Madrid (O00452), or the Getty Museum in Florence or Rome towards the end of the 16th century or the beginning of the 17th century (HS9429). Due to the high price of the material used as well as the need to have highly specialized personnel for these creations, only some of them were made in such high quality, and were destined to the main courts and palaces, so that examples are preserved only in museums such as those mentioned and in important private collections .."
Two axes of flowers flanked by vegetal scrolls facing each other and with geometric arrangement have been placed in the center. This motif frames a white line that forms rhombs on the smaller sides, along with another blue line. To the outside, another band leaves squared spaces in the corners with simplified flowers and simple scrolls. A wide blue band and a narrower white band remain towards the outside. 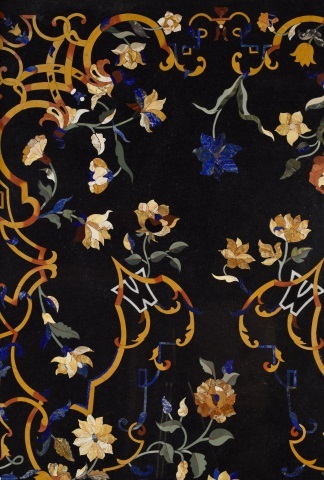 The technique known as "hard stone work" resembles that of marquetry, but uses marbles of different colors and stones of a hardness greater than 6 on the Mohs scale instead of wood. He was born in Florence, with the attempt carried out by Piero de Medici and Lorenzo the Magnificent to revitalize a mosaic technique of Ancient Rome called "opus sectile". Such was the success, that the workshops multiplied throughout Europe, among which the Factory of Gobelins in France, the Royal Workshop of Naples (which took over from the Medici) and the one established at the Real Sitio de El Buen stand out Withdrawal from Madrid by Carlos III, which had the support of quality local specialists but was closed with Napoleon in 1808 and destroyed in 1812. The objects made (desks, tables, vases, plates ...) showed at the beginning a great decorative variety, but, from around 1600, a clear protagonism of the naturalistic elements over the geometric ones was noticed: flowers, fruits, birds, pearls, butterflies ... This example is the heir of this tradition, as shown by comparing it with works such as the Madrid Prado table made by Francesco Ghinghi at the Real Laboratorio Delle Piedre Dure in Naples (catalog number O00511), or the board of the late sixteenth or early seventeenth century created in Rome (inventory 62.259) of the Metropolitan Museum in New York, or those preserved in the Opificio delle Pietre Dure Museum in Florence or the examples of the National Museum of Decorative Arts in Madrid. However, it is necessary to emphasize the update towards more contemporary tastes that can be appreciated in the geometric game made with the white and blue bands." 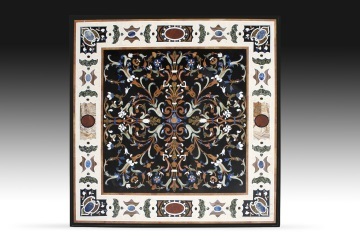 SQUARE PIETRA DURA TABLETOP. MARBLE AND HARDSTONES. Square tabletop. Marbles and hard stones. Inspired by Italian models of the XVI-XVII centuries. A pearl necklace with a bow has been placed in the center of the board, on a black background. It is surrounded by an area of \u200b\u200bvegetal scrolls, flowers and birds perched framed with a band of simplified scrolls. On the outside, eight fish have been placed in the corners facing each other two with a ball, a crown and placed on an architectural motif, visually united by means of vegetal scrolls. 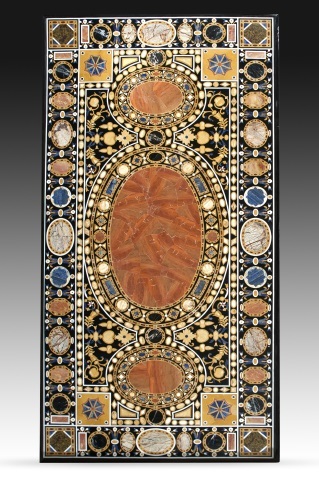 This inlay, called "hard stone work", which uses colored marbles and stones of a hardness greater than 6 on the scale of Mohs arose in Florence, thanks to the attempt of Piero de Medici and Lorenzo the Magnificent to revitalize and update a technique mosaic called "opus sectile" used in Ancient Rome. Such success had in the European courts, that, since the seventeenth century, a series of workshops were created following his example, among which we must highlight the Factory of Gobelins in France, the Royal Workshop of Naples and the one established by Carlos III in the Real Site of El Buen Retiro in Madrid, which continued in operation until the beginning of the 19th century. Stylistically, they began with a striking variety of motifs, but, since about 1600, naturalists (flowers, fruits, butterflies, birds ...) were preferred as a general rule. They were made with this technique tabletops, plates, desks, vases, etc., always for the high aristocracy and royalty for the high prices of these jobs, due to the high specialization required since, very often, they had to import the raw material (lapis lazuli, agates, Belgian black marble used to be for the funds ...). 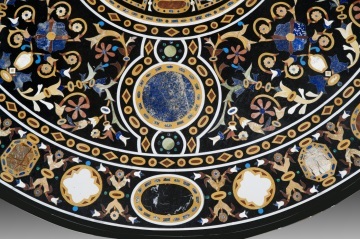 The present example is the heir of this important tradition, whose influence is shown by comparing it with works such as the Opificio delle Pietre Dure in Florence, the Roman panel of the late 16th century (inventory 62.259) of the Metropolitan Museum of New York, or the one made in Naples by Francesco Ghinghi towards the middle of the 18th century (inventory O00511) preserved in the Prado Museum in Madrid." 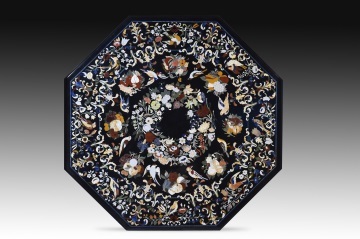 The objects made (desks, tables, vases, plates ...) showed at the beginning a great decorative variety, but, from around 1600, a clear protagonism of the naturalistic elements over the geometric ones was noticed: flowers, fruits, birds, pearls, butterflies ... This example is the heir of this tradition, as shown by comparing it with works such as the Madrid Prado table made by Francesco Ghinghi at the Real Laboratorio Delle Piedre Dure in Naples (catalog number O00511), or the board of the late sixteenth or early seventeenth century created in Rome (inventory 62.259) of the Metropolitan Museum of New York, or those preserved in the Opificio delle Pietre Dure Museum in Florence or the examples of the National Museum of Decorative Arts in Madrid. However, it is necessary to emphasize the update towards more contemporary tastes that can be appreciated in the geometric game made with the white and blue bands." 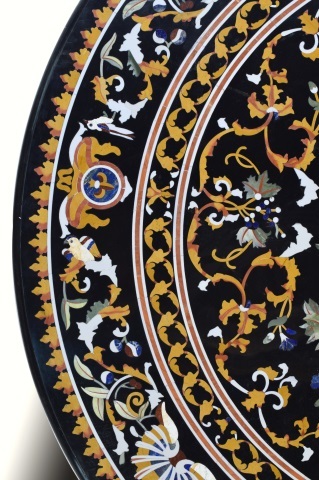 RECTANGULAR “PIETRA DURA” TABLETOP. MARBLE AND HARDSTONES. Rectangular board of marbles and hard stones. Inspired by Italian models of the XVI-XVII centuries. 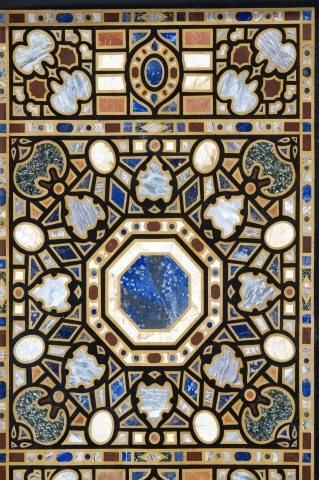 Rectangular table top with geometric decoration organized symmetrically around an octagon of lapis lazuli framed in a star with teardrop-shaped elements cut out. Flanking that central motif two bands with an oval in the center, and is framed all with a thin band of squares and rectangles separating, also the three zones. 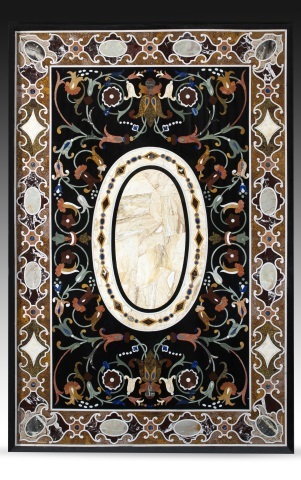 All these designs have been made combining marbles and hard stones of different colors, in a similar way to wood marquetry. 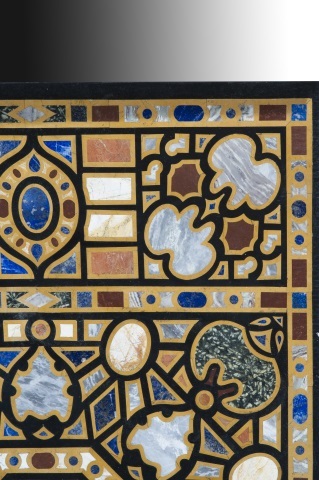 This technique is known as "hard stone work" for the materials, and its beginnings are in an attempt to revitalize the mosaic called in ancient Rome "opus sectile" carried out thanks to the Medici in Florence in the fifteenth century. The present example shows a clear influence of these beginnings, because after 1600 the naturalistic motifs (birds, fruits, flowers) proliferated on the geometrical ones, leaving these normally to frame different central motifs. Compare the panels preserved in the Opificio delle Pietre Dure Museum in Florence, with the confessional of the church of San Alejandro in Milan built during the seventeenth century, or with a panel of the Museo del Prado (inventory O00468) from around 1600, for example. The success of the technique is demonstrated by the expansion in Europe of this type of tabletops and desks and other furniture of the same technique. Highlights, above all, the Factory of Gobelins in France and the Royal Workshop of Naples after the disappearance of the Medici. With Carlos III in Spain, another important production center was installed in the Buen Retiro Palace in Madrid, which was closed at the beginning of the 19th century with the Napoleonic invasion. Both the materials, often imported, and the need for personnel highly specialized in the realization of these boards, were always works for the highest aristocracy and the courts." A frame of simple geometric elements and white oval shields accompanied by architectural details highlights, thanks to its light tones, the decorative motif of the center. This one, located on a dark background, is formed by vegetal scrolls and flowers organized by lines towards the interior, camouflaged thanks to those stems, so that, despite the abundance of decoration, the flower with four petals of the center stands out. 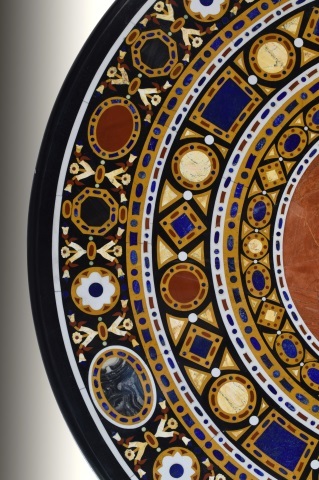 The "hard stone work" used in this table is very similar to marquetry, but it uses marbles and stones of a hardness greater than 6 on the Mohs scale. 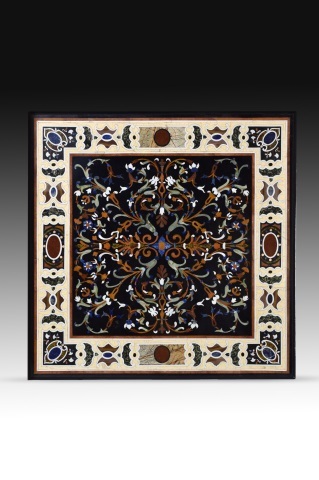 The idea arose in Florence, when trying to revitalize a type of mosaic that they used in Ancient Rome called "opus sectile" in the time of the Medici. Such success had, very soon, other workshops in Europe, among which it is necessary to highlight the Factory of Gobelins in France, the Royal Workshop of Naples and the one established by Carlos III in the Real Sitio of El Buen Retiro in Madrid, the which closed at the beginning of the 19th century. The present example is heir to this tradition. And stylistic influences are also appreciated. 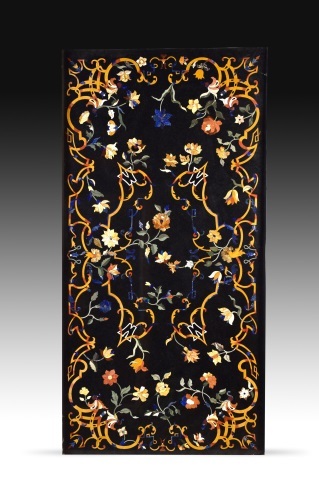 Although at the beginning there was a great variety of decorative elements in these stone inlays, since 1600 the naturalist motifs gained prominence, which were gaining in variety over time to include butterflies, birds, fruits ... 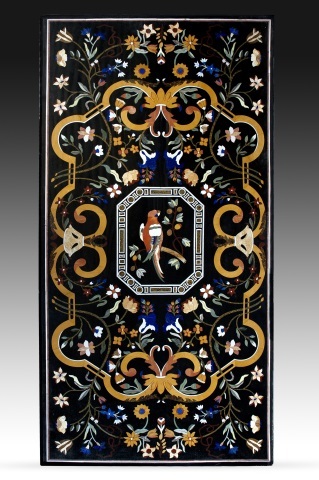 Compare this example with those preserved in the Opificio delle Pietre Dure in Florence, with the Roman chess board between 1565 and 1590 from the National Museum of Decorative Arts of Madrid (inventory CE 27144) or the anonymous roman board from before 1636 (O00470) from the Museo del Prado." 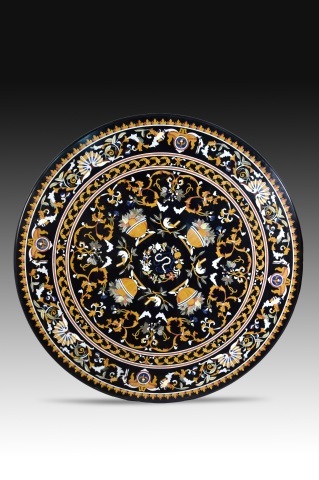 PIETRA DURA TABLETOP. MARBLE AND HARDSTONES. “FLOWER”. Circular panel made of marble and hard stones. "Flower". Inspired by Italian models from the 16th-17th centuries. A flower surrounded by vegetal scrolls presents / displays like main motive in the center, and is outstanding by its brown colors, in contrast to the pale ones of the environment, made with vegetal elements and branches with fruits on which there are several birds perched while Some butterflies are cut out on the black background. 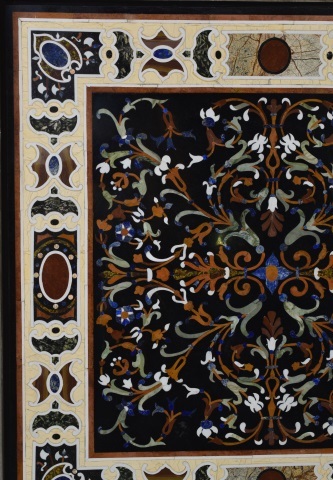 To make the board has been used a technique similar to the inlay in wood using marbles and different hard stones like lapis lazuli. 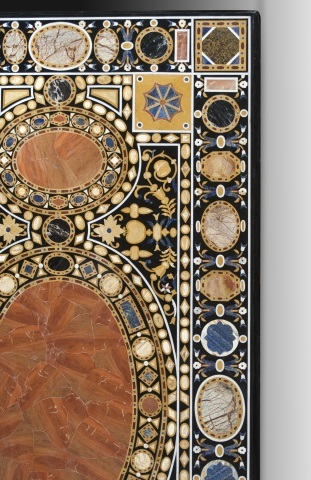 The history of "hard stone work" was born with Piero de Medici and Lorenzo the Magnificent in Florence, who wanted to revitalize the technique of the Roman mosaic (opus sectile) made with colored stones with the relevant variations of thematic and technical. After 1600 the primacy of the decoration of naturalistic motifs on the other themes that appeared in the fifteenth century is clear. In the seventeenth century France was the first court to show a clear interest in the technique of hard stone establishing local production centers (Factory of Gobelins) and, while in Italy, the Royal Workshop of Naples takes over the Florentine and by Then disappeared. In Spain, Carlos III established another one in the Real Palace of the Good Retirement of Madrid, that closed at the beginning of century XIX. With the passage of time, and based on the protagonism of the vegetable motifs, the models were changed to suit the tastes of the time. It was always work done for the high aristocracy and the courts for the high price of materials and labor. The present example is a worthy heir to this important tradition. 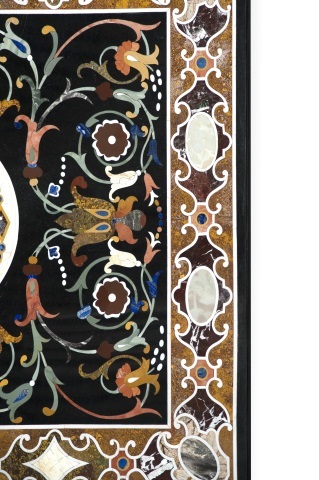 Compare with those preserved in the Museo Opificio delle Pietre Dure of Florence, the board of Francesco Ghinghi (O00511) or the one realized in Naples (O00466) of the Museum of the Prado of Madrid." · Size: Diam. 90 cms. ROUND SIDE TABLE IN “PALOSANTO” WOOD AND WHITE MARBLE TOP. Velor in wood of rosewood with white marble top. 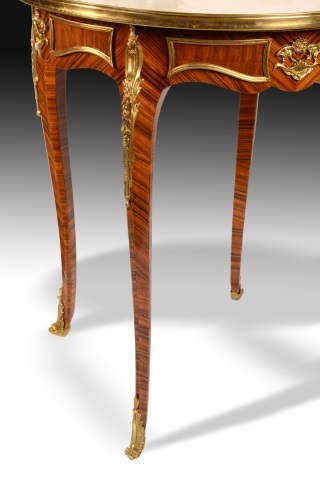 The four cabriole legs are joined with the waist without visual separation to highlight the wood of rosewood, which has also been used in plates on the fronts of the table changing the arrangement of the veins. The decorations in gold metal present vegetal elements, architectonic and oval mirrors. 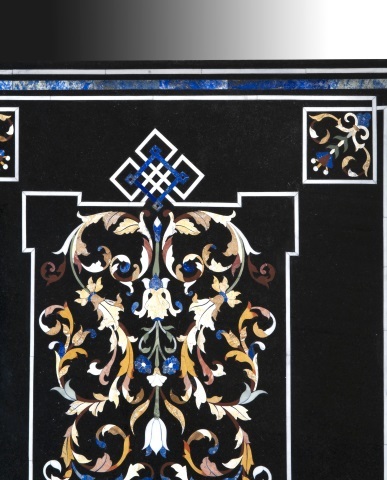 The top panel, marbled white marble, contrasts and highlights the wood." 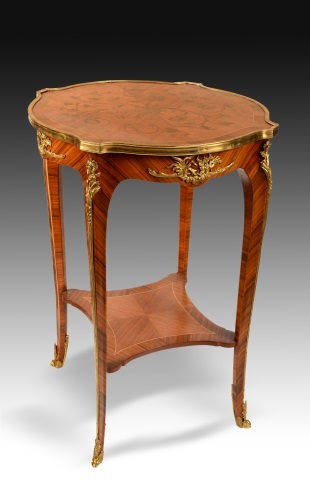 LOUIS XV STYLE SIDE TABLE WITH BRONZE AND MARQUETRY WORK. 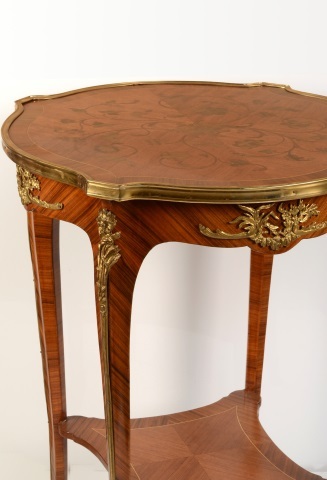 Louis XV style table with bronze decoration and marquetry. 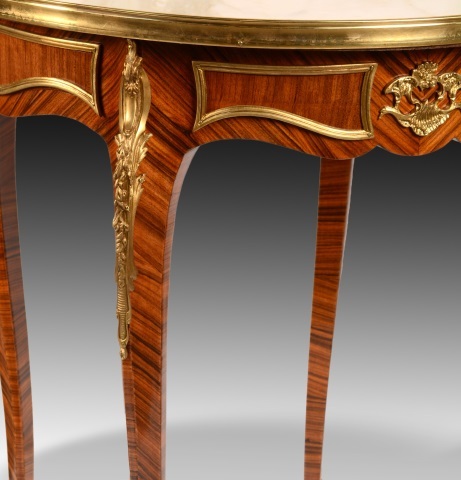 The four cabriolet legs have been joined at the bottom with a square shelf with concave edges and have been decorated with plant elements in gold bronze, as well as the waist of the table. The top board, round with straight extensions, shows scrolls with leaves and inlaid flowers. 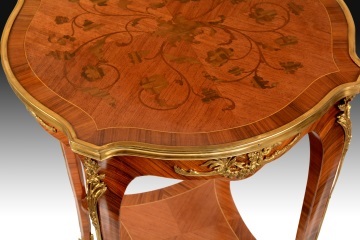 Both profile curves and bronzes have been inspired by examples of the Louis XV style." 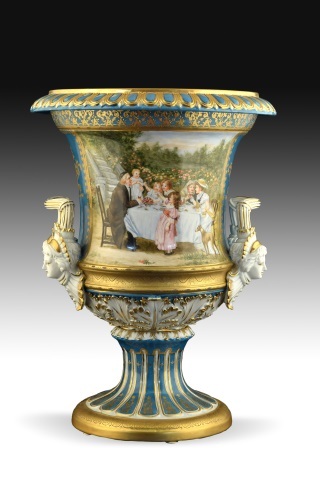 Cup in enameled blue porcelain, with hand painted scene. Inspired by 19th century models from Meissen (Germany). The cup, in ceramic-inspired profiles of classical antiquity, has two handles in the form of female masks, as well as decorations based on eggs, gallonate forms and vegetable elements in relief highlighted with golden edges. 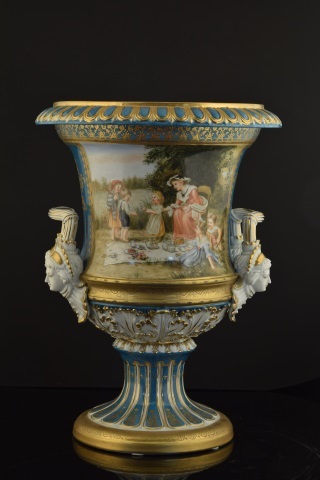 The combination of porcelain in that characteristic blue tone with the material in its color takes the attention of the viewer to the details of the work and the scene of its front, with peasants located in a natural environment. 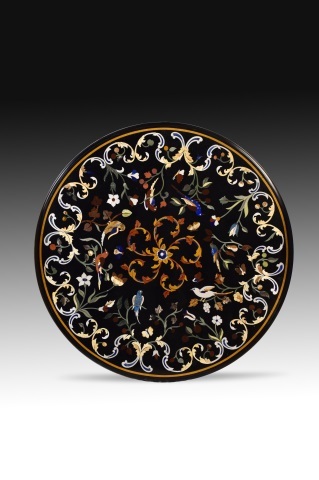 The work is inspired by nineteenth-century models of the Manufacture Nationale de Sèvres (France)." 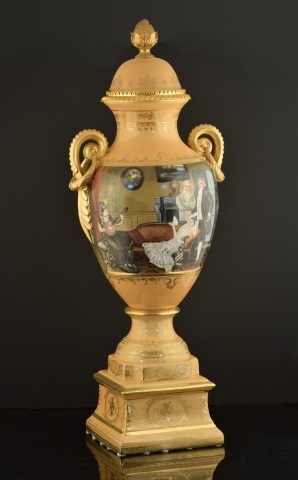 The play of tones between the enameling of the vase and the golden appliques yields all the protagonism to the two scenes of their fronts. 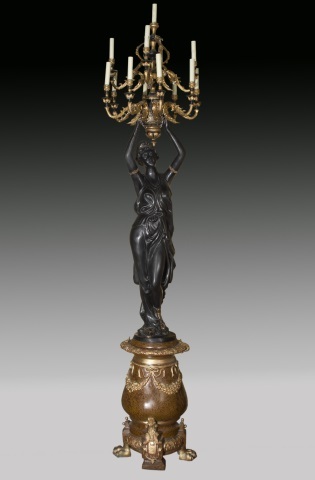 These show two interiors of a house belonging to a wealthy bourgeois family in the manner in which these works were made towards the beginning of the nineteenth century. 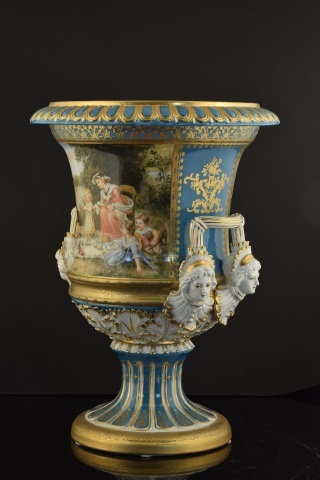 The classicist elements that decorate the work relate it to works of the same century of the Manufacture Nationale de Sèvres (France). 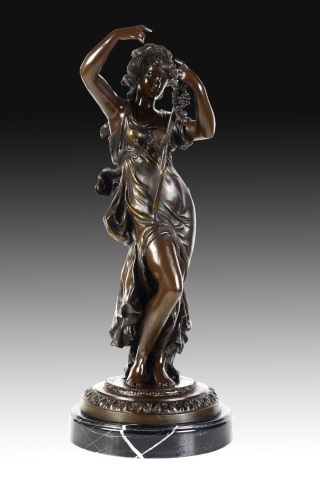 BRONZE SCULPTURE, LADY WITH GRAPES. 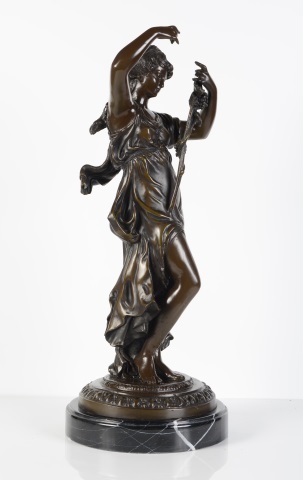 Lady with grapes, bronze sculpture with marble base. On a circular marble base, stands a female figure. The lady appears dressed in a robe and holding a staff with grapevines and grapes, marking an elegant contrapposto. His design and posture are based on classic models, in addition to remember works such as the classic Goddesses of August Moureau (1834-1917), French sculptor known for his creations with delicate filigree." 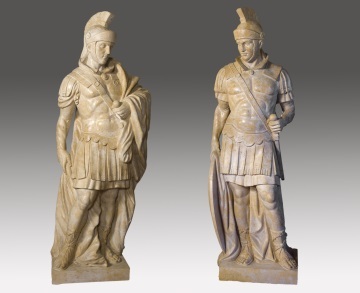 PAIR OF ROMAN GENERALS IN TRAVERTINE. Couple of Roman generals in travertine. 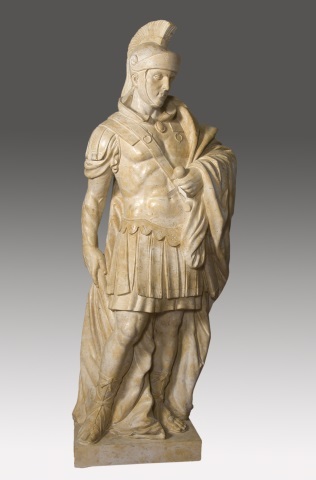 Both sculptures show marked influences of one of the sculptural currents of the Roman Empire: one that is inspired by Greek Hellenism. The two generals wear thoracatas armor, and one holds a short baton while the other supports his hands on the gladius and the shield. The travertine, sometimes nicknamed as marble, is a sedimentary rock already used in sculpture and construction in Ancient Rome and whose main quarries are in Italy." 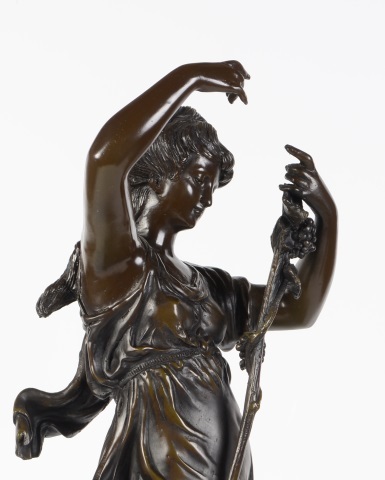 A pair of bronze figures, they represent two women holding a large thirteen-arm candlestick on their heads. 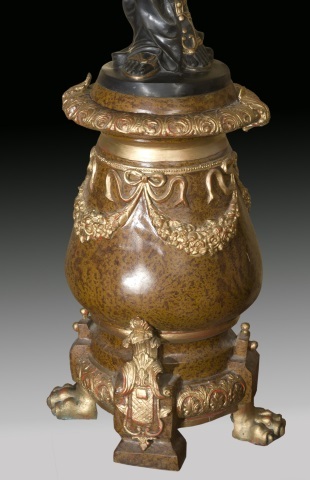 The base is formed by a pedestal decorated with floral garland supported on lion claws."